This month, we are proud to feature one of our amazing members: Penny Finch! Penny lives in Prosser with her family and joined CBRC in June 2018. Originally, Penny joined CBRC just for a place to exercise with her kids over the summer. She was later convinced to stay and be a member year-round. Little did she know that it would be life-changing! One day, Penny saw a flyer hanging on the wall for the Balanced Habits Life Nutrition Program. She was curious, and couldn’t get the program off her mind. 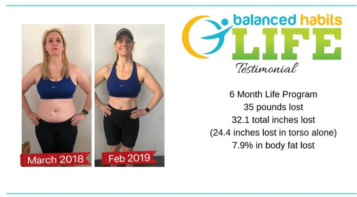 After exercising for years and yo-yoing with her weight, she was “finally fed up with that kind of lifestyle!” She began the 6 month life program in August, and completed her last month in February. However, she shares that now “I’m still eating the same way as I did while being monitored!” That’s what makes this program different – it really is sustainable. Penny loved that this program is truly about a lifestyle, not a diet that would end. She loved learning about the fats, carbs, and proteins, and how to properly read food labels. Penny shares that her weekly meeting with her food coach, Tiffany, were amazing. “I laid down my silly pride and admitted that I did not know everything. I took full advantage of having a food coach!” When she did that – she truly found success. She lost 35 pounds. Penny knew that this program was going to be a sacrifice “regarding time for meal prep, time at the grocery store, and financially.” She saw this program as an investment in her life. Penny shares that “what I didn’t know was [that] the return on this investment [in the program] would benefit my whole family!” Her kids are even supportive and call her backpack cooler her “food bag” and offer to carry it for her wherever she goes! Thank you Penny, for being an inspiration to all of us at CBRC! Your determination and hard work is so motivating, and is what we are all about. For questions and registration information for the Balanced Habits Life Nutrition Program, visit our Nutrition page! Get fit. Have Fun. Love life.